Lewis Hamilton set an impressive practice pace at the first European Grand Prix in Azerbaijan as he finished comfortably quicker than Mercedes Formula 1 teammate Nico Rosberg around Baku. Reigning world champion Hamilton , who was also quickest in first practice, clocked a 1m44.223s, 0.690 seconds quicker than Rosberg on the super-softs tires. Hamilton set the fastest first sector, but lost time in the second and had a personal best in third to indicate that there was plenty more to come from the Briton on low fuel. Rosberg stopped out on track with 20 minutes to go, reporting a problem with drive. That led to race control deploying the virtual safety car while marshals extracted the car. Ferrari also had some worries. It struggled for pace with Sebastian Vettel eighth, 1.996s adrift of Hamilton, and Kimi Raikkonen 12th, then encountered an MGU-K issue on both cars. Raikkonen locked up into Turn 4 escape road with a few minutes remaining and then parked the car in the escape road when the problem hit. Vettel was then ordered to slow down and return to the pits shortly afterwards, with Ferrari telling him he had the same problem as his team-mate. The top five cars were powered by Mercedes, with Force India the surprise challenger as Sergio Perez and Nico Hulkenberg ended up third and fifth, respectively. Valtteri Bottas was the quickest Williams, splitting the Force Indias in fourth, with Carlos Sainz Jr. the fastest non-Mercedes runner in sixth in his 2015 Ferrari-powered Toro Rosso. Red Bull was kept busy in between practice sessions after Daniel Ricciardo crashed at Turn 15 in the morning and an oil leak cut short Max Verstappen’s session. Both were back out for the start of the session with Verstappen ending up seventh, 1.845s off the pace, and Ricciardo 10th. Jenson Button was the leading McLaren in ninth with Fernando Alonso 11th, having spent a chunk of time mid-session in the garage while the team worked on the car. Romain Grosjean was 12th for Haas while it was a disappointing session for Felipe Massa who ended up 16th, 1.3s slower than teammate Bottas. Marcus Ericsson was delayed in getting out on track as Sauber changed his engine following an exhaust problem in practice one, but he eventually joined the fray and ended up 19th. 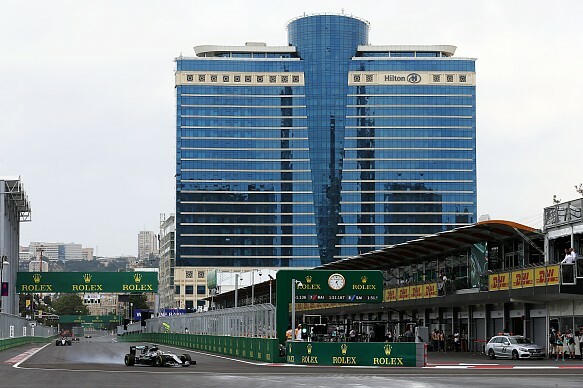 Earlier in the day GP2 qualifying was postponed due to curb problems but FIA race director Charlie Whiting carried out an inspection and said the problem had been resolved with some welding prior to F1 action resuming. Replays showed there was still some loose curbing and race control subsequently issued a message instructing drivers to stay clear of the kerb at Turn 6. A number of drivers struggled to get the car slowed down at Turn 3, forcing them to take to the very narrow runoff, while Esteban Gutierrez brushed the wall at Turn 8 and Sainz had a high-speed spin into the first corner.